Restoring a classic car raises many questions, and we have answers. Below are answers to many common restoration questions, but we always encourage customers to email or call us anytime to chat! What do you do in your shop? We perform complete restoration services, ranging from simple classic-car maintenance to full rotisserie, show-quality restorations. We currently have 18 people on staff, including dedicated metal fabricators, mechanics, body technicians, painters, video / TV production, photography, web development, and administration. While often asked, it is impossible to predict the total cost of a restoration when considering the numerous variables of a project. These and many more elements determine the overall restoration cost, but we can assist in the planning of your project to help your vision come to life. Can you help me plan my restoration? Planning and Project Management are two very important parts of the restoration process, and we work with the vehicle owner to create a solid plan and then stick to the plan to prevent additional time and costs. 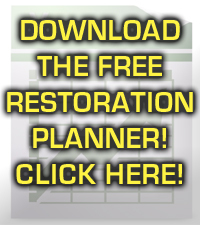 CLICK HERE for a FREE Restoration Planner document we've created to help the process! Vehicle owners are free to bring the car themselves, or we will help with transport options to deliver the car. Vehicle owners are responsible for packing their car or parts safely for transport. Should a vehicle be returned to the owner disassembled, the owner is requested to supply packing materials, moving blankets, crating, tie-down straps, or other items needed for safe transport. An enclosed trailer is also requested. The V8 Speed & Resto Shop is capable of protecting and loading a vehicle for transport, however the standard shop rate will apply along with any additional materials such as blankets, crating, protective foam, or other materials required. What if I do not have a vehicle yet, can you find one for me? We can assist with locating a car. We provide vehicle location and inspection services for customers for a nominal fee. How long do restorations take? Depending on the factors listed earlier, restorations can take months to several years. Do you complete stock original restorations? Yes. We can return a vehicle to as-new condition or modify it as the customer wishes. Do you work with other shops? We perform most of the restoration services in our shop, save for extensive custom upholstery, convertible tops, engine machine work, wheel alignments, and tire mounting. We have had customers request that certain stages of their restoration be done by other shops during the process. While we are generally OK with this, it must be noted that a if a partially completed restoration project leaves our shop to visit another, the vehicle has left our control and we are not responsible for the other shop's work or damage incurred on the vehicle. This can include paint chips and scratches, "un-doing" of our work for another shop to perform tasks, loss or breakage of parts, changes in our design or installation of parts, other shops not working to the same quality standard as our shop, etc. The customer is responsible for the time necessary for our crew to package and load the parts and vehicle should it leave our shop. We will photograph the entire vehicle before it departs to have an accurate description of condition and completeness before it leaves so the customer can be sure of the status when the vehicle left our shop. Likewise, we will document the condition of the vehicle when it returns to our shop for completion and alert the customer of any issues found that occurred out of our possession. Once a plan is in place, we request a pre-payment to help us start the process. This amount will be different for each project, but the money is used to help cover the initial labor and parts, or material costs needed to begin the job. Our shop sends invoices weekly to ensure that our shop and our customers are in constant communication and "on the same page." We charge a shop rate for time, parts and materials are additional. The invoices are generated from our Technicians' time entries as they work, so there is great detail on our invoices. However, we are always happy to provide greater detail or explanation of services should the customer request it. Due to our weekly invoicing structure, payment is expected upon customer receipt of invoice. If payment is not promptly received, work will be suspended and the vehicle will be placed into storage until the customer account is brought to current status. Pre-payment terms are available to prevent customers from accruing a balance with the shop. We understand there are times when a project needs to be "put on hold", and we will gladly work with customers who let us know in advance that they foresee a work stoppage. Should a customer fail to submit payment in a timely manner, we will make arrangements to place the vehicle in local storage at the customer's cost of $125.00 / month until the balance is caught up or a solution is agreed upon. This protects the customer from incurring any additional labor charges while the vehicle is in storage. We are flexible and are always willing to work with a customer to help ensure the project is completed to their expectations. Accepted payment methods include cash, checks, or online payments through credit cards and e-checks. Paying by check is preferred and has no fees involved. Credit cards are convenient, but there is a service fee charged to us which we in turn add to your next invoice. The average fee is about 3%. What happens if I have a question about something on an invoice? Should there be a question about an invoice, we encourage customers to contact the shop as quickly as possible to resolve the matter. We understand there are sometimes items on invoices that require clarification, and we encourage our customers to review and question the invoices upon receipt to make sure everything makes sense and appears correct. We are always eager to provide greater detail or adjust for billing errors should they occur. 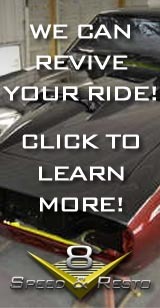 We are authorized retailers for many industry-leading automotive part manufacturers, and we offer competitive pricing. We sell everything from restoration parts to performance parts. Who supplies the parts for my car? We build LOTS of cars, so we are dealers for all the major restoration and performance parts. 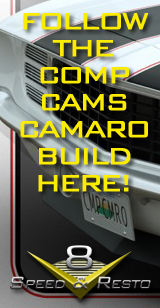 We can offer competitive pricing on everything needed to build your dream car. We KNOW the parts. Often times, there are several options for restoration or performance parts, and we know the "good ones" to use. The wrong choice can equate to additional labor time making something fit or work properly, where the right choice can be a huge time saver. When we order the parts, we can track the parts. We maintain a highly detailed spreadsheet for each car in the shop. We log all the part numbers, suppliers, date ordered, order status, shipping date, tracking numbers, and arrival date when they reach the shop. If there is ever a problem, we can track, return, or exchange the parts quickly. Incorrect parts are delivered to our shop far more often than one might think. This can come from mis-labeling at the factory, a part not meeting our quality standards, a broken or damaged part, or a variety of other reasons. Depending on the supplier, returns can be quick and easy, or a drawn-out process requiring constant back-and-forth communication. Customer supplied parts can add significant time and distress to this process, especially when the crew is waiting on decisions from a customer who is unavailable. When we order the parts, we can manage these situations more efficiently while reducing headaches for the customer. Because of our strong relationships with our suppliers and our dealer status, suppliers often provide additional services to find us what we need in a timely manner. Shipping costs are often reduced when we purchase parts in bulk and have large shipments delivered to our commercial address. Have you heard the saying, "You don't bring steak to a steakhouse?" We spend a lot of time researching the best parts and suppliers to use. By installing what we sell, we can offer better support should a part not perform as expected. KEEP IN MIND that MANY restoration and performance parts have NO FACTORY WARRANTY, and often, the time frame from part purchase to installation can be longer than the factory warranty. What happens to parts removed from my vehicle? Often times, there are many parts that are removed from a vehicle in favor of new or modified parts installed in our shop. We recycle scrap metal, but we require customers to manage these "take off" parts, and we can help bundle parts for pickup by customers. We prefer not to be responsible for the storage, sale, shipping, or other handling of take-off parts, as this process can be very time and space consuming. Will my car be photographed during the restoration process? All the cars are photographed for documentation and communication purposes, some are displayed in public galleries to share with the world, and some even become features on V8TV's TV and Web show! Do you do partial restorations / modifications, or only complete cars? We perform everything from simple classic car maintenance to complete rotisserie show-car restorations. What about mechanical upgrades, like fuel injection or air conditioning installs? We install many popular upgrades into classic cars to make them more enjoyable to drive. How do you tune and "break-in" a completed restoration? We always drive and tune the cars we restore to ensure all systems are working properly and the car performs as intended. This can be up to 500 miles on complex cars, less on others. We'd rather have minor issues be resolved while the car is still in our possession before delivery so we can quickly remedy them. How does a restoration affect the value of my vehicle? The documentation of the vehicle, original bill of sale, build sheets, etc. The options installed from the factory - sometimes cars with no options are worth more than those with many! They say "They are only original once" and that statement holds bearing on vehicle values. For example, a sought-after car like a 1970 Chevelle, outfitted from the factory with the SS 454 performance package, in bright red, with low miles, and in excellent original condition, is most likely going to be worth more than a restored version with performance upgrades that are not original. It is very possible to spend more on a restoration than the car is worth on the open market. For this reason, only experienced purchasers should consider classic cars as investments. Our shop specializes in what we call "Heirloom Cars", meaning these are vehicles that have more sentimental or nostalgic value than current street market value. These are cars that the owners never plan to sell. Perhaps the car belonged to a family member or was bought new and never left the family. Perhaps it is a car that a customer had years ago and always regretted selling, and how has another. We understand the value of these sentimental attachments and treat the cars with the same level of respect as our customers do. We are NOT the shop to come to if you want to "flip" a car bought cheaply and try to make a big profit... we do not perform "quickie" paint and restoration jobs just to make a car look good for a sale. The term is "putting lipstick on a pig" and that's not how we operate. If a customer is seeking a fun car to drive, it might be best to start with a lower-level version of the car of choice... for example, it's probably not a good idea to heavily modify a numbers-matching 1969 Camaro Z/28 with a different engine and aftermarket performance parts. However, finding a "plain-Jane" version.. a base model Camaro, maybe a 6-cylinder car, will not reduce the overall value by a V8 conversion and modified parts. What happens if the plan changes midway through a restoration? We work with the customer to formulate a solid build plan, but there is a situation that we call "Might as well syndrome", where the customer adds items to a restoration purely because of an opportunity to do so. For example, if the crew is restoring the front suspension, and the parts are disassembled, that's logically a good time to upgrade the stock suspension to something offering better performance. After all, the parts are already disassembled, why do the work twice? "Might as well do it now while it's apart!" The customer needs to recognize that these changes WILL add additional time and cost to the restoration of a vehicle, and will negate any original budget plan or estimate made. A simple analogy is a restaurant... the steak dinner might list as $20.00 on the menu, but when you add drinks, salad, dessert, and tax... the bill is no longer $20.00. Change Orders will be agreed upon by the customer and V8 Speed & Resto Shop when the plans change, so that everyone has the same understanding of the scope of work and costs involved. It's important to keep in mind that these are old cars, and they have possible crash damage, hidden rust / corrosion, or previous repairs that might present themselves during the restoration process. As hard as we try, we cannot always "see through the paint" and know what a car might require until the job has started. We always present our findings to the customer for discussion and a repair plan and then proceed as directed, but these situations can add costs and time to a project. Who's insurance covers the car during the build? The owner is required to insure the car, but we maintain a full shop-keeper's policy to protect the vehicle under our care, custody, and control. Is there anything you do NOT do in-house? We do not sew (i.e... make custom seat-covers, etc.,) in house. We use partner shops to mount and balance tires on wheels and to perform wheel alignments. We do not perform engine machine work, although we do engine assembly. We work with a variety of race-proven engine machinists for block work, head work, rod resizing, crankshaft modification / repair, etc. We do not install headliners or convertible tops, but work with partner shops to complete these tasks. Although some services are not completed by our staff, we have resources to manage these tasks on any project.